Coconut milk is a healthy alternative to use in cooking or baking. It is a good base for healthy soups and stews since it is rich in both flavor and nutritional value. 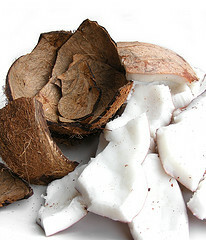 Real coconut milk is made from the meat of a well-matured coconut and can be found in your local market. Coconut milk contains Vitamins E and A, chloride, potassium, calcium, and lauric acid. It can help your body fight many pathogens including virus, bacteria and various fungus that can attack your body. Its nutrients help protect your heart and arteries. It is also good nutrition that feeds your hair and skin leaving both smooth, silky and youthful. Lauric acid, found in both coconut milk and coconut oil, is a medium chain fatty acid that is similar in nutritional benefit to mother's milk. It is transformed into monolaurin in the human body which is then used to destroy lipid-coated virus including HIV, herpes, influenza, heliobacter pylora, various protozoa (parasites) and other pathogenic bacteria. Studies in the Philippines showed coconut oil to help reduce viral load in AIDS patients. Along with destroying pathogens, coconut oil contains an excellent source of easily assimilated nutrients used by your hair and skin. It contains proteins that help your body build new skin cells and hair follicles. The healthy fats and Vitamins A and E feed those cells so they stay fresh and healthy. Plant calcium is more easily assimilated than its animal counterpart therefore more is able to be used by your body. Coconut oil and milk has gotten a bad rap in mainstream medicine because of the saturated fat content. It was vilified as clogging arteries during a mass campaign against all saturated fats that was instigated by faulty science and the vegetable oil industry fighting to gain position as top dog in selling cooking oils to the public. Fortunately for our taste buds, this is not true while instead the many health properties are now becoming widely understood. In fact, the saturated fat in question, lauric acid, is easily metabolized by the body. It is the same fat found in mother's milk and promotes strong bones and healthy brain development. And, as already stated, it is also anti-carcinogenic, anti-bacterial, anti-viral and anti-microbial. As with anything, when purchasing coconut milk – read the label. The fewer ingredients listed the better and shopping at your local health food market will probably yield better results.